The Pacific Rim National Park Reserve is the best the west coast has to offer. Dedicated as a national park reserve in 1970 by Princess Anne, the park consists of three parts - Long Beach, the Broken Group and the West Coast Trail. The entire park is 51,300 hectares (126,761 acres) including 22,300 hectares (55,103 acres) of ocean, starting at Port Renfrew in the south and going up island to Tofino in the north. This park encompasses the most striking features of Vancouver Island's west coast, with inviting beaches, majestic forests, and offshore islands that are home to birds and animals. The only Highway to Long Beach (Pacific Rim National Park) is Highway 4, that starts at Parksville, travels through Port Alberni and on to Ucluelet and Tofino, 140km (86.6mi) away. The 42.5km (25.7mi) section of Highway 4 between the two villages of Ucluelet and Tofino has road access to Long Beach. 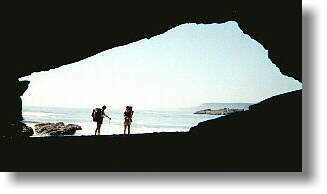 There are numerous signs with information about where you can hike, stroll the beach and camp. For a good overview of the park, visit the Wickaninnish Centre, an interpretive centre with theatre programs, exhibits, displays and activities helping visitors to understand the marine ecology, ocean and rainforests. Start exploring Long beach at Schooner Cove. As you approach the beach, leaving behind the cedar-hemlock forest, the Sitka spruce becomes prevalent. This Sitka spruce fringe goes all the way around the outer edge of Vancouver Island and the Queen Charlotte Islands. The sitka spruce is especially adapted to grow in this area.. To really get a feeling of the fringe, take the Spruce Fringe Trail. The Rain Forest Trail takes you into a coastal forest where the vegetation is dense, and reaching upward are the gigantic red cedar, western hemlock and amabilis fir. There are six more trails to hike and enjoy: the Willowbrea Trail, Half Moon Bay Trail, Gold Mine Trail, South Beach Trail, Wickaninnish Trail and Shoreline Bog Trail. There are other natural highlights to the park. Bird watching is very popular, and over 200 species have been spotted, ranging from the albatross to the waxwing. Every spring , over 20,000 gray whales move through these waters on their annual migration from Baja California and Mexico to the Bering Sea.. There are locations in the Park for whale watching, or you can take a whale watching tour. Surfing, a somewhat new sport, is excellent at Long Beach. Incinerator Rock is a popular surfing spot. Or, just go beach combing. The roar of huge surf, the mists of morning fog, the lush coastal rainforest, combine with an abundance of wildlife to make your west coast experience truly unique and memorable. Make plans to visit Long Beach, a part of the Pacific Rim National Park. The middle part of the Pacific Rim National Park, consists of the Broken Group Islands located in Barkley Sound. The Islands lie south of Ucluelet and north of Bamfield and cover an area approximately 130 sq. km (52 sq. mi) and vary in shapes and sizes, none larger than 2km (1.3mi) across. This archipelago embodies over 100 small, rocky islands that can only be reached by boat. You can put in a Toquart Bay, north of the Broken Group, or else take the Lady Rose from Port Alberni and travel down Alberni Inlet. The Lady Rose will drop you and your gear off on a Floating dock, near Gibraltar Island at the northwest corner of the Broken Group. If launching your trip from Toquart Bay, turn off Highway 4, at Kennedy Lake, onto a logging road that heads to the bay. This is a favourite area with ocean kayakers, canoers and scuba divers. Take note, this is a wilderness area and you must be experienced in kayaking and canoeing. The Reefs, the old shipwrecks and the rich marine life makes this an excellent place for scuba diving. There are also designated dive sites, from novice to expert divers. The canoeing and kayaking season is from April to October, with July and August being very busy. It's recommended that you travel in groups of 2 to 3 kayaks. There are 7 islands with designated camping areas and you must camp in these areas. The longest stay at any one island is 4 nights, and 14 nights is the maximum total stay on the Broken Group Islands. You can travel back and forth, from island to island if you wish. Expect to see oyster beds and rocks covered in black mussels. Be ready to inspect hundreds of tidal pools. Anglers can expect to go fishing for spring salmon, coho and even cod. River otters, martens, mink and racoons live along the shorelines, so look for them. In the ocean waters watch for habour seals, whales, porpoises. and sixgill sharks. Sea lions like to sun themselves on rocks by Wonwer Island. For a kayaking and canoeing experience of a life time, make the Broken Group Islands your destination. The most famous hiking trail in British Columbia, the West Coast Trail, is the southern part of the Pacific Rim National Park. A lot of tragedy and history are part and parcel of this section of Vancouver Island's west coast. More than 60 ships have gone down in this part of the ocean, known as "The Graveyard of the Pacific". One of the most tragic was the sinking in 1906 of the steamship Valencia. Rescuers from shore and nearby vessels were unable to reach the ship, and when it went down, 126 passengers and crew members perished. The following year the federal government began construction of a lighthouse at Pachena Boat and a lifesaving trail along this coastline. The trail followed a rugged telegraph route built in 1890, thus connecting lighthouses at Cape Beale and Carmanah Point with other lighthouses and towns towards Victoria. Between Bamfield and Carmanah Point, a distance of 47km (29mi) a 4 metre (13 foot) wide trail was to be built, so that any shipwrecked sailor could reach coastal communities with ease. From 1907 to 1912, a team of 60 men constructed a route from Bamfield to Pachena Point, from this point it became impractical to continue. From Pachena Point to Carmanah Point the route was a 1.5 metre (4.9 foot) wide trail. South of here it continued as the original telegraph line trail. With modern navigation and communication, the trail became obsolete, and overgrown by vegetation. Only the trail to Pachena lighthouse was maintained. In the 1960's interest to re-open the trail grew. In 1973, Parks Canada started reconstruction. The 47 km (29 mi) section from Pachena Bay to Carmanah Point was rebuilt, while the 30 km (18.6 mi) portion from Carmanah to Port Renfrew, the most primitive, was upgraded. It was completed in 1980. 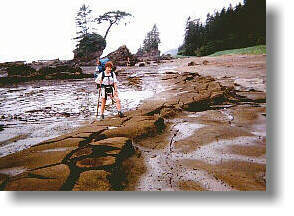 The 77 km (47 mi) of beach and forest hiking trail, The West Coast Trail, starts at Port Renfrew in the south. The northwest point starts at Pachena Point, 3km (1.8mi) from Bamfield. There is a reservation-registration system in place. The Trail is open from May 1st to September 30th, and 52 hikers are allowed into the trail daily; 26 hikers from the northern end (Pachena Bay) and 26 hikers from the southern terminus (Port Renfrew). 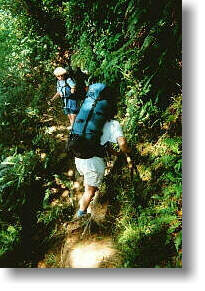 Most hikers prefer to start at Port Renfrew, hiking the most challenging section first. There's bus service from Victoria to Port Renfrew and from Pachena Bay (trail's end) local taxi provides transportation to Bamfield, with bus service to Victoria. If starting your hike from Bamfield, you can go in from Port Alberni or else from Duncan through the Cowichan Valley. A boat ride from Port Renfrew to the mouth of the Gordon River means your hiking journey is underway. On the early part of the trail, you should be careful as you negotiate the steep cliff-side ladders and paths. The huge logs that cross the muddy sections, can be very slippery. Cable trolleys span the larger gorges. Be careful, crossing streams, as some do have deep crevices . Do use a hiking staff. 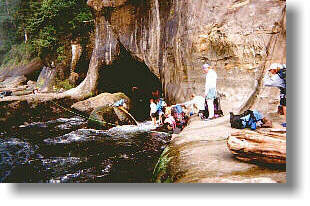 From Carmanah Creek to Klanawa River, the most picturesque section of the Trail, includes the Tsusiat Falls. Near Pachena Bay, there are remnants of cabins used by linemen who maintained the trail in early days. Some people combine hiking the West Coast Trail and canoeing part of the Nitinat Lakes. You must be self sufficient, be prepared for long-days and heavy packs (pack it in, pack it out) and all types of weather. This is a challenging hike. If you are a novice hiker, the West Coast Trail is not for you. 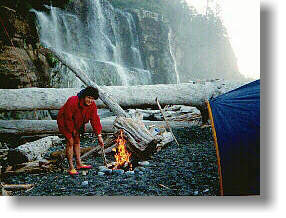 To make hiking the West Coast Trail a very pleasant and memorable experience, it takes stamina, planning and caution. Enjoy what Vancouver Island's west coast has to offer; visit one, two or all three regions of the Pacific Rim National Park. The West Coast Trail is open May 1 to September 30. Reservations must be made to ensure that the parks natural habitat is protected from over-use. 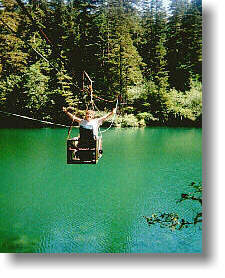 Starting points are from Port Renfrew, Bamfield and Nitinat Lake. Beginning in January, reservations for the West Coast Trail can be made for any date between May 1 and September 30 through the Parks Canada Reservation Service. Spaces fill quickly, so consider setting up an account prior to January.